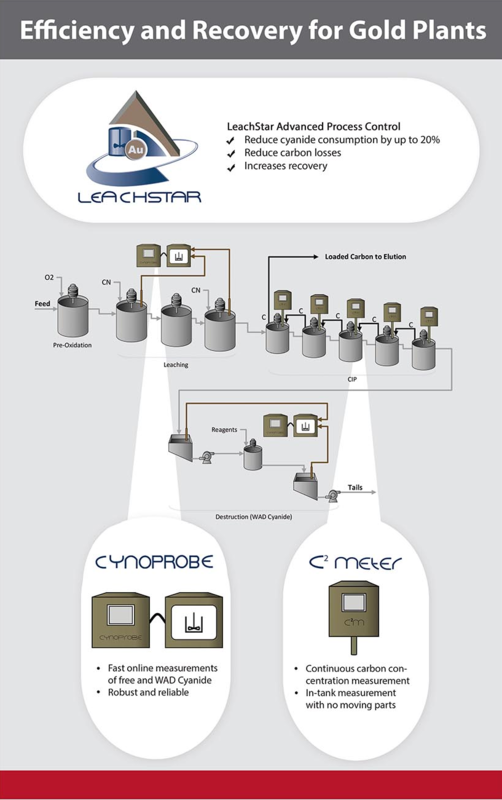 A critical parameter in the efficient operation of Carbon-in-Leach (CIL) and Carbon-in-Pul (CIP) processes is the accurate measurement and control of carbon concentration in the pulp. The C² Meter v2.0 allows quick setup, easy installation and calibration as opposed to the traditional manual measurement methods which can be irregular, time consuming and often inaccurate. This can lead to poor carbon management in the circuit and loss of gold. The C² Meter v2.0 is fully self-contained and comprises an immersion probe and its associated control panel. 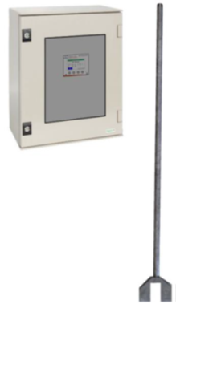 The probe, designed and constructed to measure continuously in the adsorption tank pulp, contains a matched transmitter/receiver pair of piezoelectric (PZT) ceramic transducers to measure the carbon concentration using ultrasound. The meter allows quick setup, easy installation and calibration. It is supplied with a 100-240 VAC power supply, a 4 to 20 mA output, an error output relay and one 4 to 20 mA optional density meter input. Continuous on-line measurement of carbon concentration in a pulp. The C² Meter consists of a control panel, with a LED touch screen display and a probe. The probe may be mounted up to 5 metres from the electronics cabinet and is connected to the cabinet by triaxial cables. The control electronics generates a 1 MHz pulse envelope, called the transmitter pulse, which is sent to the transmitter probe through the triaxial cable. The pulse is transmitted ultrasonically by the crystal in the transmitter probe, through the slurry to the receiver crystal. This received pulse is fed back through the triaxial cable to the control electronics; and the attenuation is measured. One of the variable parameters that influence the carbon concentration result is the relative density (RD) of the slurry. The meter requires the RD of the slurry to be read in from a density meter, or input via the LED touch screen display as a parameter. The C² Meter displays the carbon concentration and the density of the slurry, as well as the transmitted and received voltages, and the transmitted/received signal level ratio in dB. The carbon concentration indication is provided on a 4 – 20 mA current loop output for remote monitoring or interfacing with a plant control system. Click here to view the C² Meter brochure.